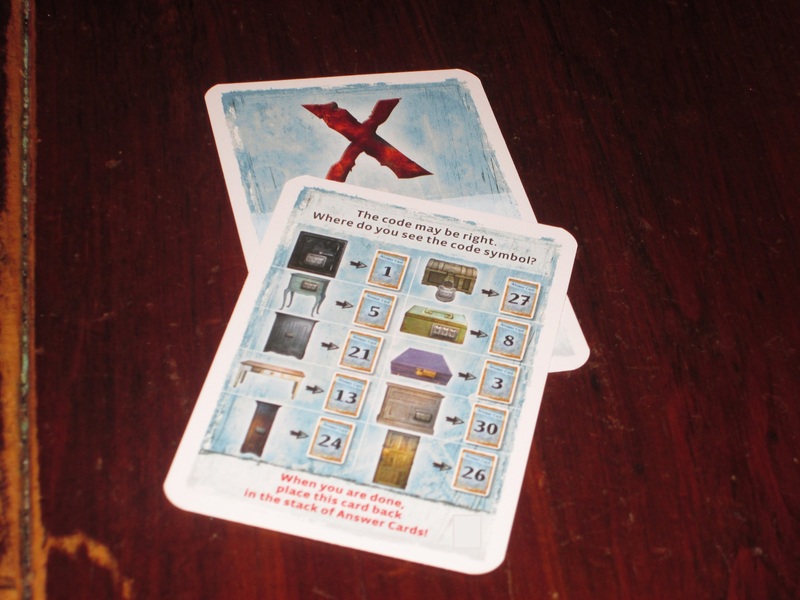 Exit uses a two-step solution process, which injects more tension and excitement into an already tense and exciting game. What do a mysterious cabin in the woods, a secret laboratory, and an archaeological dig site have in common? They are all places that you’d rather not be. Except that you’d really rather be there because you paid to be. But–well, the experience is all about finding the exit. 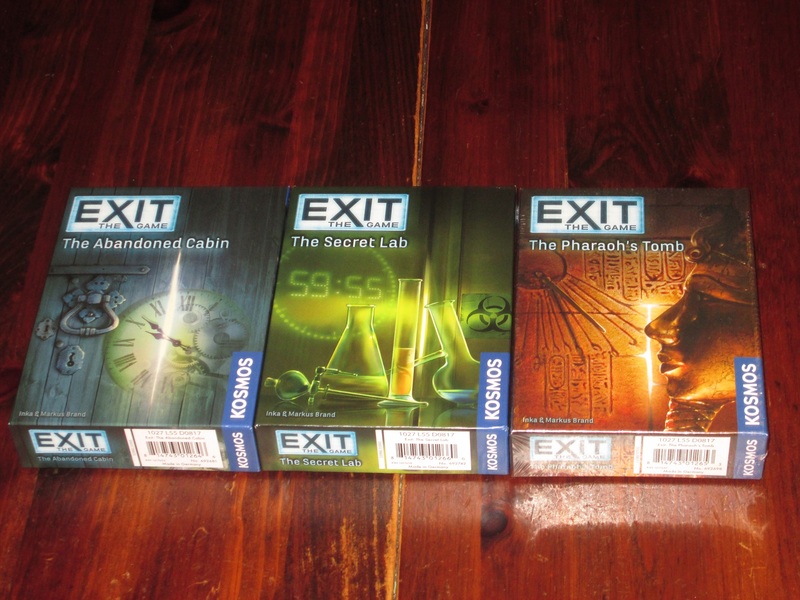 Exit: The Game is a one-time-use escape room for one to six players. Players solve the puzzles as quickly as they can and are rated on how well they did based on time spent and number of hints used. Three stacks of cards are used in the game. Before playing, players unwrap the card decks and separate them into three stacks–answers, riddles, and helps. At the start of the game, players read the instructions. 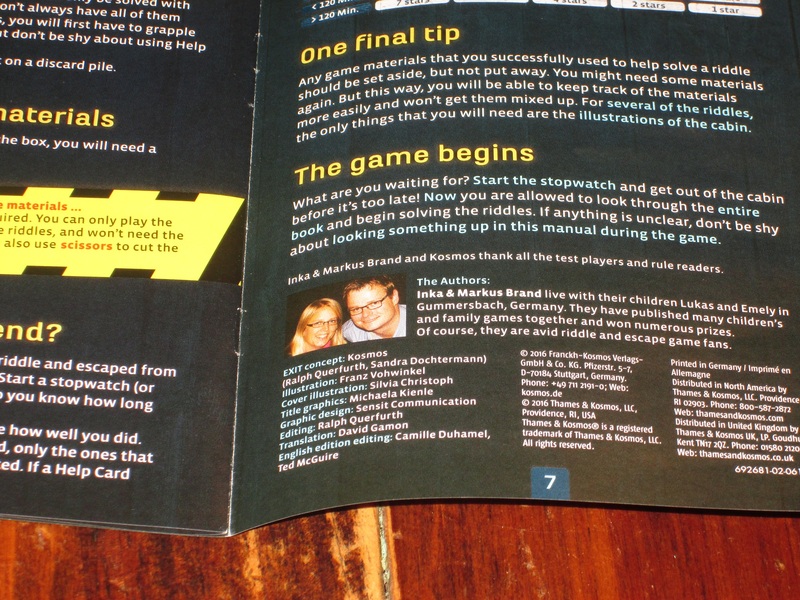 Once the instructions are read, they start a timer and can open the accompanying player book. Players reveal cards from the riddle deck when the player book or other cards tell them to (or when they see one in a picture*). Each puzzle is tied to a symbol around the decoder wheel, and each puzzle is solved by a three-part code. When players think they have solved the puzzle, they rotate the wheel so the decoder wheel matches their code, and they find the corresponding answer card in the deck–which may be right or wrong, and even if right, there’s another step before an answer is given. The puzzles in Exit are designed to destroy components, so puzzles may involve writing, cutting, or folding components in order to solve the puzzles. 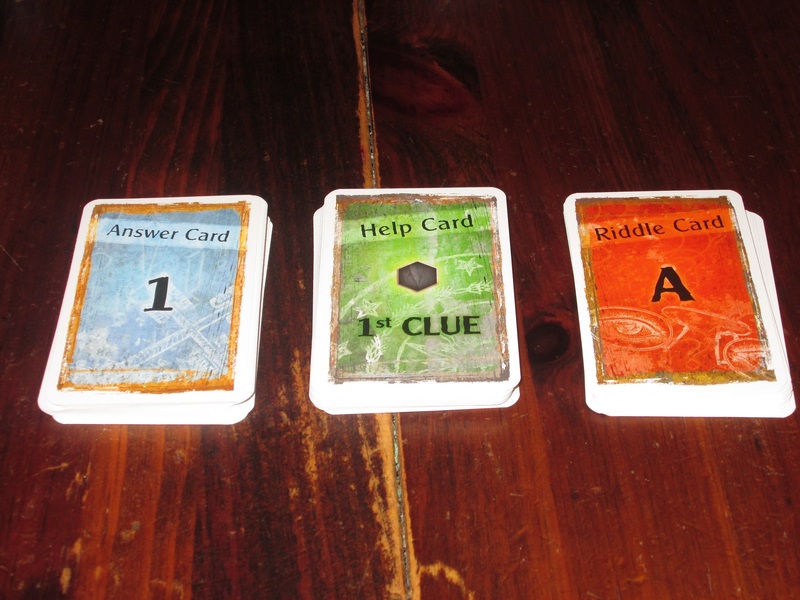 If players are ever stuck, each puzzle has three “help” cards tied to it–a 1st, 2nd, and solution card. 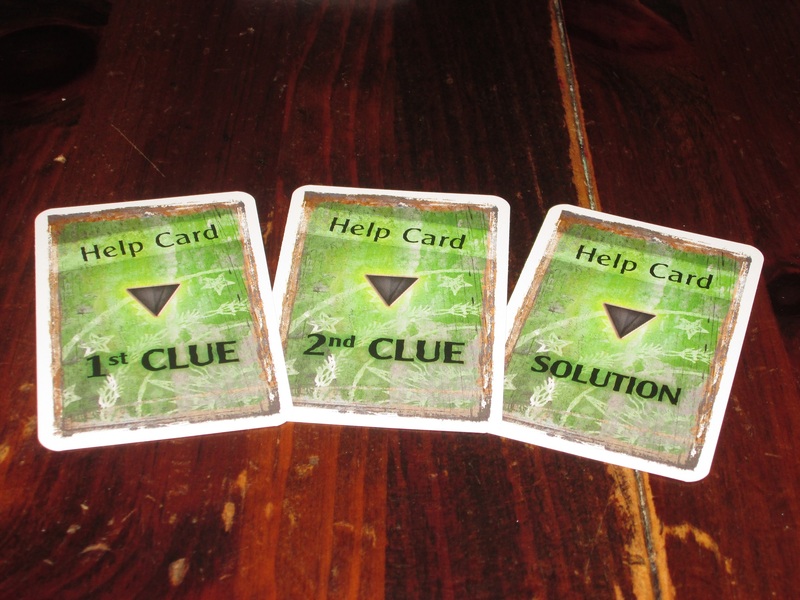 If a solution card provides no new information, players set it aside; it does not count against their final score. However, if it reveals new information, it does count against the score. The game ends once players have solved all the puzzles. Players look at the score sheet in the back of the instructions to determine how they did, based on how much time they spent and the number of hint cards used. * Note: Unlike Unlock (which relies on hidden objects), these are not “secret” objects–they are obvious. As I mentioned in my Unlock! review, I’ve always loved puzzles. Crosswords, sudoku, logic puzzles: I like them all, the cleverer the better. So escape rooms seem like a natural fit for me: a series of puzzles strung together by a loose story? Fantastic! And Exit: The Game delivers on this premise in spades. In fact, Exit: The Game is one of the most fun experiences I’ve had on the tabletop this year, and maybe in the last five years. 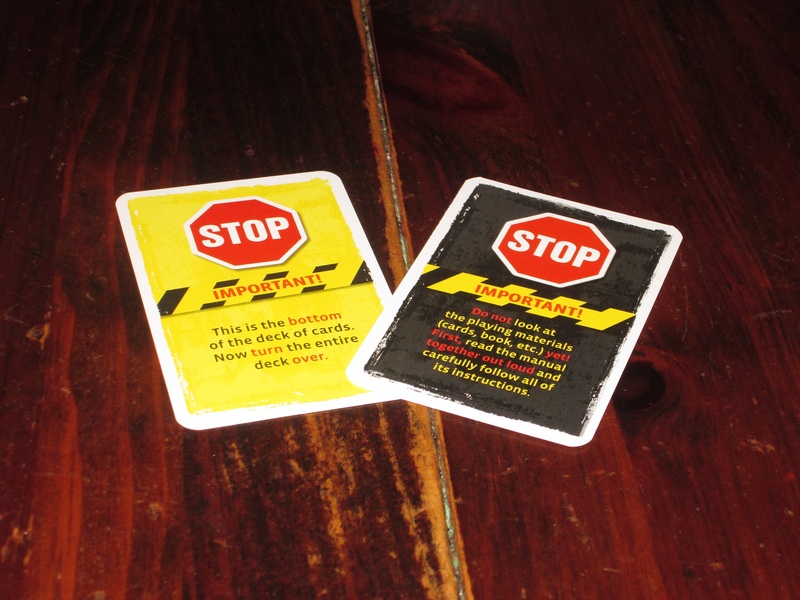 These cards warn you that you need to handle the cards appropriately to avoid spoilers (as I’ve done in this review). The excitement begins even before you start the timer for the scenario, as you begin to handle the components. Each game comes with a booklet, three small decks of cards, a decoder, and some “strange objects” that you find as you solve puzzles. 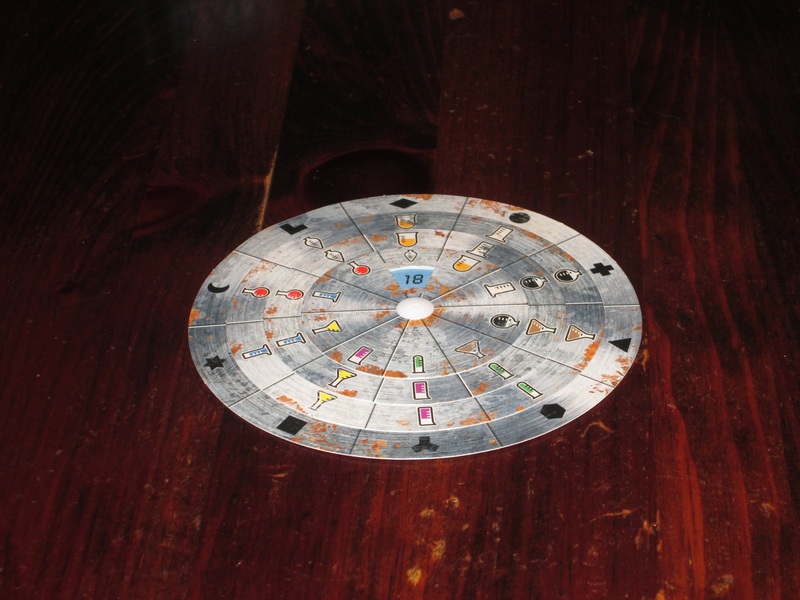 The game box warns participants that the game is one-time use because players will mark up and destroy components, adding an element of finality to the already mysterious proceedings. Even before you crack the book, the decoder wheel heightens the sense of anticipation, as does the small cardboard frame of “strange objects,” the use for which you will have to discover as you play. Each Exit scenario begins with a thin explanation of what’s happening and immediately thrusts you into the puzzles you have to solve. You start the timer and begin. What separates escape room puzzles from the typical pen-and-paper puzzles I did growing up is scope: the game provides you with everything you might need to solve the puzzle, but it’s up to you to decide how to use what you’ve been given. It’s sometimes difficult to know how you should pair objects together to get results, and you might receive objects in advance of their usefulness, but this is the fun of the puzzle: you have to figure out what the puzzle is, first, and then how to solve it. 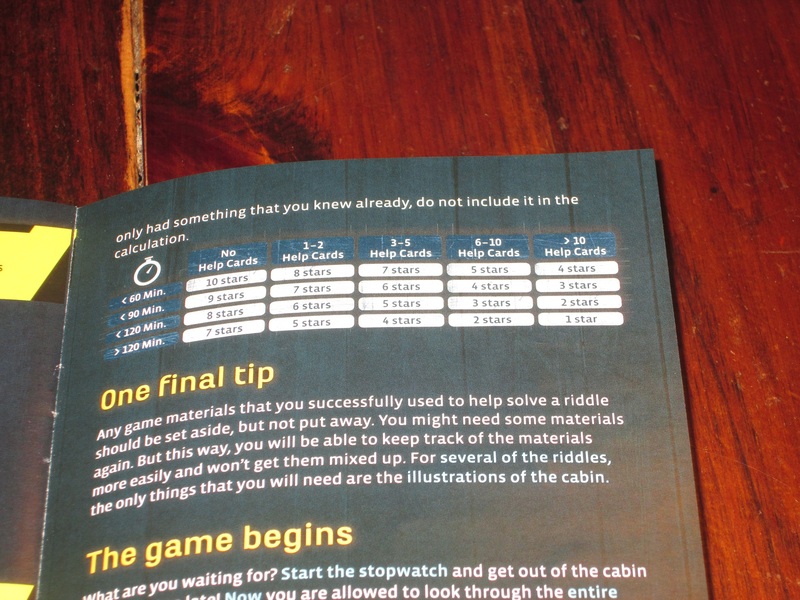 And Escape has some of the cleverest puzzles I’ve done. Far from being gimmicky or requiring the logical leaps of a consulting detective (*cough* Sherlock *cough*), the puzzles in Exit are rewarding and also solvable–if you’re in the right frame of mind. “Frame of mind” is key. You see, the puzzles are solvable, but they are not necessarily easier for that. If you are going about the puzzle thinking in one way, you might completely miss how to solve it. In one set of puzzles in “The Secret Lab,” my wife and I spent maybe half an hour trying to decipher what we were supposed to do, and we couldn’t figure it out. We used two hints from the hint deck, and still, all hope seemed lost. All of a sudden, something clicked, we changed our perspective, and boom! we solved the puzzle. We marveled at the cleverness of it, laughed at our stupidity, and briskly moved on. Inka and Markus Brand, the authors of Exit. They seem like nice people, their devilish puzzles notwithstanding. But these are the best moments in the game: the moments when you have a breakthrough and you almost share a knowing look with the designers, who smile at you from the game’s rulebook. You recognize that they are smarter than you, but they’ve also shown you that you’re more clever than you thought you were. And that is a good feeling. Exit is full of moments like these–satisfying puzzles that reveal hidden depths within you or your fellow escapers. It is full of moments of frustration, triumph, and ultimately delight as what seemed like just marks on a page a moment ago is revealed to be much more significant. 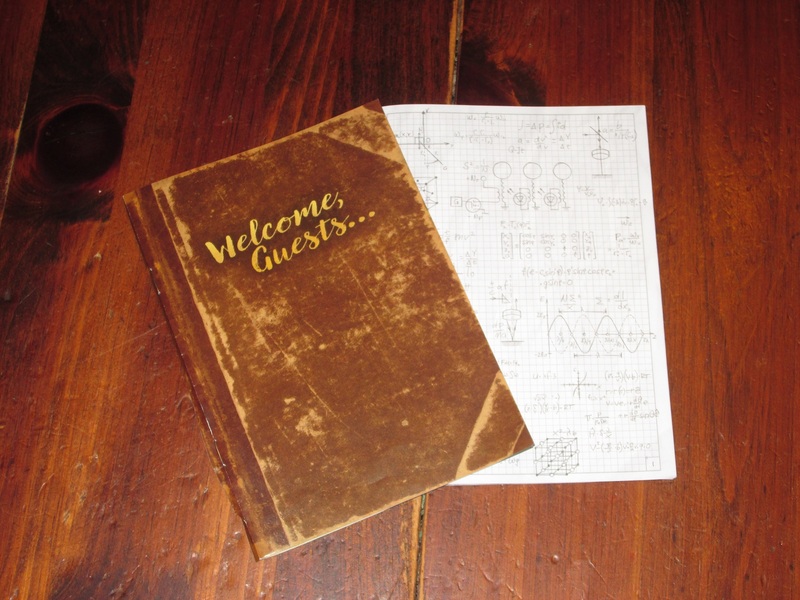 Each game comes with an accompanying puzzle book, which can be written on, cut up, folded, and otherwise destroyed. It’s probably better to enter the game knowing that you’re going to destroy the components. Much of Exit’s appeal is in the physicality of the game, a physicality that is born of its initial warning on the back of the box that, yes, you will destroy components. Entering the game with the mind-set that what you have before you can be MacGyvered into your ticket out opens possibilities and a decision space absent from, for example, the fully card-based Unlock. Whereas I might try more mental rotation in a different game, here I feel the freedom to cut, write on, and mar as needed. In one memorable instance, my wife decisively poked a hole in a card that didn’t need a hole poked in it. We laughed about it afterward, but the freedom to do so is real. The decoder wheel is old-school and also wonderfully physical. I’m glad that this wasn’t replaced by an app. The physicality of the decoder wheel versus entering codes in an app was also fun for us. Everything you need in the game is included in the game box, and the first scenario we completed mostly in the park as the sun went down, no electronic devices required. Each code in the game is entered and solved using a multi-step process, and this is without exception exhilarating. You enter the code in the decoder wheel and look up the answer card number. If the code is wrong, you might find out right away with a red X. If the code is right, there’s another step: you get redirected to a key card and asked which puzzle you’re solving, which then points you to another card: either an answer card unlocking more possibilities, or a red X (you were wrong after all!). This multi-step solution thickens the tension in the game, and it makes each code entry feel exciting. I love this. Help cards. There are three for each puzzle, so if you get absolutely stuck, you can still move on. I also like the hint system in Exit. Instead of being penalized for a hint you didn’t use, Exit offers a hint deck on the honor system. You can look at a hint card if you get stuck, but if it doesn’t give you any information you didn’t know before, it won’t count against your score. This is a nice way around the sour grapes I felt in Unlock! when unhelpful hints counted against us. I think Exit is the bee’s knees, but some are less keen on it than I am. One of the criticisms I’ve heard against Exit: The Game is that the individual rooms lack a coherent “story.” And I can agree with that, for the most part. Aside from thematic backdrop, the story is a little thin. But, on the other hand, the conceit of being locked in a room and having to puzzle your way out is in general a little thin, so I’m not sure it should be held against Exit that it relies more on puzzles than story to provide entertainment. That seems par for the course. Another criticism–and this one strikes closer to home with me–is that Exit is a one-time-use experience. It involves drawing on and otherwise destroying components, preventing you from handing it on to someone else when you’re done. This is a bummer with the system–after each Exit scenario we’ve done, my wife and I were dying to hand it on to someone else so they could enjoy it too–but it is not a deal breaker. I know, I know: this sounds hypocritical, as I mentioned the price was steep for Unlock!, and that game can be handed off after use. But the whole experience of Exit is so engaging, and the wanton destruction of components is so central to that engagement, that I’m okay with it here. Even though Unlock! and Exit are priced the same ($15 per scenario MSRP), I felt like Unlock! was a bit overpriced while Exit I find a bargain for the amount of fun in the box. (Obviously, tastes vary, but in my house, Exit carries the day with both me and my wife.) The first scenario we did (“The Secret Lab”) took us three hours, while “The Abandoned Cabin” took us 75 minutes. And in both cases, we couldn’t stop talking about it, even half an hour to an hour after we finished. This is definitely comparable to other forms of consumable entertainment, and in some cases, a much better value. Both scenarios we’ve played with just two players, and they seem ideally suited for that number or close to it. The cards and other components aren’t large enough, really, to be viewed across the table, so the puzzles seem like they would be trickier the more heads that are bent over them. I wouldn’t refuse to play with more, but my wife has latched on to Exit as a special activity for just us, so we won’t be inviting more into our circle anytime soon. And that has been the biggest surprise with Exit: The Game. I ordered the first scenario for an activity to do on an impromptu date night, and I wasn’t sure how my wife would feel about it (to the point that I kept offering her an exit–to mini-golf, the movies, etc.). Far from finding it corny, she was just as thrilled by it as I was. Each new puzzle was a delight, and each correct code was a revelation. The puzzles are hard but solvable, and the tangibility of the components and the tension involved with two-step puzzle solving is hard to overstate. We have been utterly enchanted by Exit, which in a calloused reviewer’s home–where we see a lot of games come and go “unwept, unhonored, and unsung”–is a difficult feat to achieve. We are pacing ourselves before we bust open “The Pharaoh’s Tomb” (pictured above still in its shrink wrap), and my wife has issued a standing order to purchase all future Exit games. My advice to you is to lean into the destructibility of Exit: The Game and view it in the same way as you might a night at the movies. If you do, I doubt you’ll be disappointed. I played one of these for the first time the other day – the Pharaoh one (which I won’t spoil since it sounds like that’s the one you’ve not played) – and had an amazing time with it. We also cut something to pieces that we weren’t supposed to and wound up pulling out prototyping components to try to make an undamaged copy while we could still remember how we took it apart in the first place. I think it might be possible to damage the components in such a way that the game is unrecoverable, which is a bit of a shame, but also makes decisions feel a bit weightier. We played the Pharaoh’s Tomb scenario this weekend and loved it. I see your point about possibly damaging something beyond repair. We were glad to be working in pencil. We had to do some erasing for sure.